I told him we don’t know what his policy will pay, or what the negotiated amount is, but I helped him navigate to the search box at the top of the front page. We typed “cardio” and our search engine autocompleted by offering “cardiovascular stress test,” and then he added a 100-mile radius from 90210, the famous Los Angeles zip code, then hit “go” (see screenshot at right). Results here: prices from $88 to $818 for a cash or self-pay patient. He said he’s often responsible for 20 percent, and we agreed that 20 percent of $1,700 is a lot of money if you can have the same procedure for around $100. Another caller, from Queens, said she’s looking for a low-cost mammogram. She’s on a $10,000 deductible insurance plan. The last few mammograms she had cost her around $1,000 apiece, she said, and she doesn’t have that kind of money. Search again or refine your search. 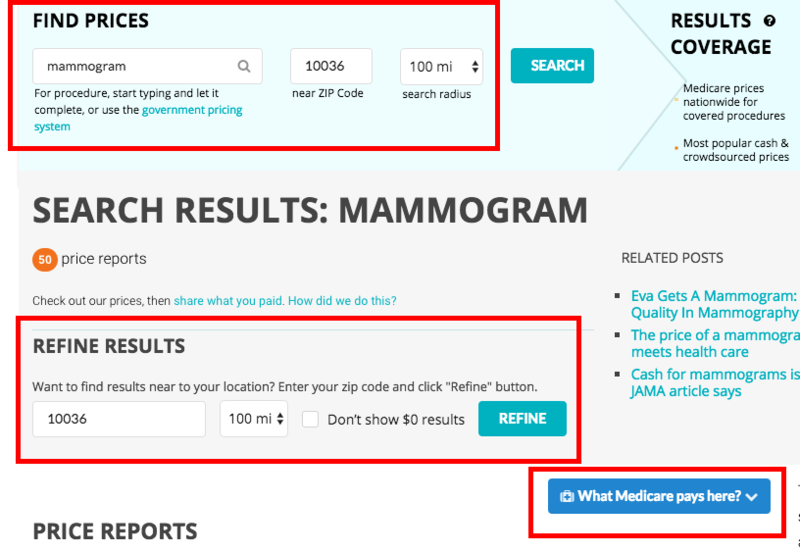 I showed her how to use the front page: search, and you get a range of mammogram providers and their cash prices . Here’s a list of New York area prices from the site, from several sources: cash or self-pay prices, crowdsourced and from Medicare, the government program for the elderly and very sick. The results: As low as $50 and as high as $544. On the results page, you can search again, or refine your search, or zero in on the rate that Medicare pays. Another person emailed to say that she has been a customer at a New York dental provider, and that the rates we reflect don’t exactly correspond with what she’s been charged. We’re looking into that. We do want people to know that our prices are not guaranteed, and that people should always call ahead to check prices if that’s important to them. Ask “How much will that cost? How much will that cost ME? What’s the cash price?” Take notes. Take names. Take numbers. Get it in writing if you can. We have had only a handful of questions about our prices in our five-plus years up on the web. In several cases, providers ultimately said that they’d given us the wrong price, and asked us to correct. So we did. In other cases, the people contributing the information were right, and the provider was wrong. We have heard from a number of people asking why we don’t tell them what exactly they will pay with their provider and their insurance policy in their state. Our answer: The insurance companies don’t share information with us about the performance of your deductible, or the negotiated rate they’re paying. We think that’s your insurance company’s job. But apparently they won’t do it or can’t do it — and the evidence is strong that they won’t or can’t, Take this as an example — a story about misfiring insurance company calculators — or this as an example — an insured person asked to pay a large sum of money for a fairly common procedure. Also, providers are not forthcoming with their negotiated rates, though they will answer quite often if we ask in the right way for a cash rate. So, in the absence of good information from providers and insurers, we are stepping in to do our best to help you. Our information is not perfect, but then who’s doing better? We’d love to hear. “Thank you so much for your note. We are not in Florida yet, but hope to be there soon. “Meanwhile, the search box will give you the Medicare reimbursement for a given procedure, which is the closest thing to a fixed or benchmark price in the marketplace. That’s the best we can do for Florida right now. How do people use your information?